Step 1. Go to the Plugin Cronjobs Module. Make sure you activate the Cron Jobs. For Products synchronization, you have to “Activate” (click the corresponding button) the wwcAmzAff_sync_products, wwcAmzAff_sync_products_cycle hook names. Step 2. Go to Synchronisation Logs. Here make sure you selected what you want to sync (Price, Title, Buy URL, Description, SKU, Sales Rank), the recurrence and number of products. Here you can check what products were synced, how many times, what’s the next products in line to be synced, the possibility to sync each product and it’s variations, or simply sync all products now. Using this module you can keep track if the Amazon product were synced, and when. We’ve improved the synchronisation module drastically, on coding level and visually as well. 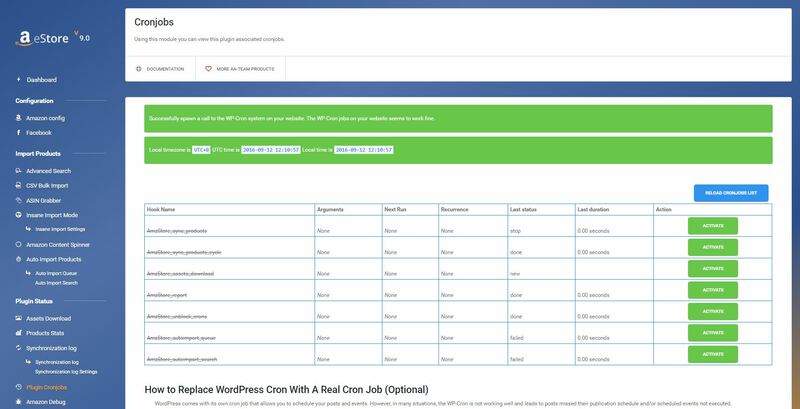 Now, it’s no more mandatory to have a cpanel cron in order to keep products updated, simply Activate the Plugin Cronjobs, select what you wish to sync (title, prices & so on) and that’s it. 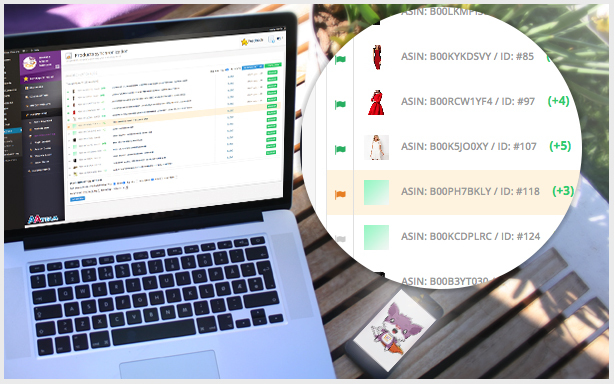 Products will get synced automatically without any effort from your side. 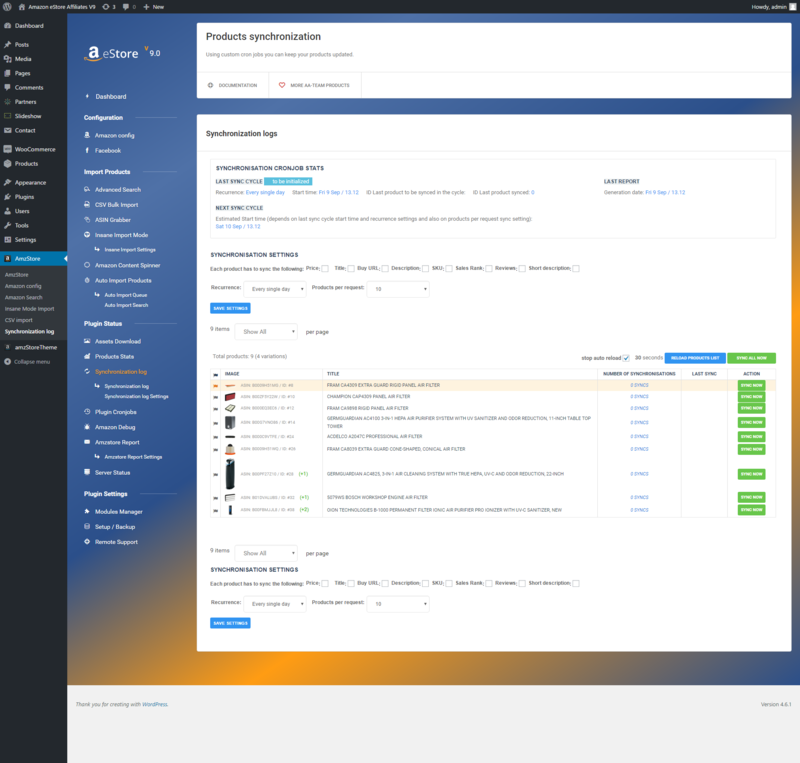 As I said, we’ve improved it on a visual level as well, on the Synchronisation Log Module you’ll find a list with all products that were synced, when was the last time, when did they synced last, what’s the next product to be synced, an option to sync each product at a time (VARIATIONS ALSO!) or simply click on the Sync All Now button and you’ll have all your products synched in no time! From the 8.0 version the synchronisation module will work different. What you’ll need to do after this update. Step 1. Go to the Plugin Cronjobs Module. Make sure you activate the Cron Jobs.